1995 Winsdown Texas Tea- (Chestnut Mare by Pride Of Ridgefield)1995 Kansas Futurity Weanling Grand Champion, 1996 Kansas Futurity Yearling Grand Champion. 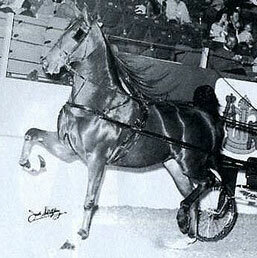 Wanna Be Me- UPHA Chapter Ten 3 Gaited Show Pleasure Jr. Ex. 13 & Under Reserve Champion. 2008 UPHA Chapter Ten Fall 3 Gaited Show/Country Junior Champion. 2009 IASPHA Spring Pleasure Equitation 13 & Under Reserve Champion. 2009 Iowa Fall Classic 3 Gaited Show Pleasure Novice Champion. 2009 UPHA Chapter Ten Fall 3 Gaited Jr. Ex. 13 & Under Reserve Champion. 2010 Iowa Fall Classic 3 Gaited Country Novice Champion. Mid-America Signature 3 Gaited Country Classic Reserve Grand Champion. 2013 Minnesota Futurity Open Western Pleasure Champion and S&B Shatner Reserve Champion. Jewels And Jazz- 2009 Taylor County Fair Equitation Reserve Champion and 3 Gaited Show Pleasure Jr. Ex. Reserve Champion. 2010 Edmonson County Fair 3 Gaited Country Reserve Champion. 2012 KASPHA 3 Gaited Country Natural Country Pleasure Champion. 2012 Lawrenceburg Fair Walk & Trot 10 & Under Champion. 2012 Dayton 3 Gaited Show Pleasure Jr. Ex. Reserve Grand Champion. 2012 Morristown 3 Gaited Show Pleasure Jr. Ex. Champion. 2012 Kentucky State Championships 3 Gaited Show Pleasure Jr. Ex. Reserve Champion. 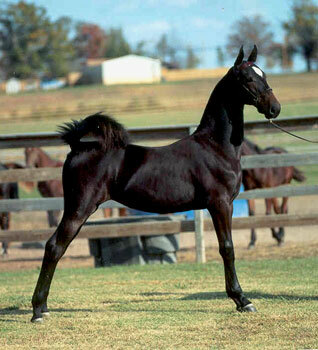 1996 CH Winsdown Sweet Oil- (Bay Mare by Pride Of Ridgefield) 1996 Texas Futurity Weanling Grand Champion. 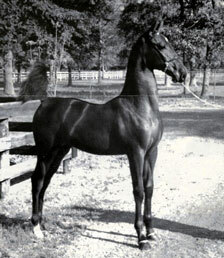 1997 Kansas Futurity Yearling Grand Champion. 2000 Iowa State Fair Show Pleasure Grand Champion. 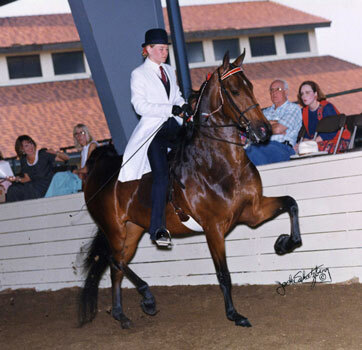 2001 National Pleasure Horse 3 Gaited Adult 30 & Over Champion, 2002 National Pleasure Horse 3 Gaited Show Pleasure Grand Champion, Mid-America Signature 3 Gaited Show Pleasure Grand Champion. 2003 Mid-America Signature Grand Champion 3 Gaited Show Pleasure Jr. Ex. Missouri and Kansas Futurities. Champion Amateur Weanling Kansas Futurity. 2003 Winsdown Steel Magnolia- (Chestnut Filly by Winsdown Black Gold) 2003 Colorado Futurity Reserve Grand Champion Weanling and Champion Weanling Filly. 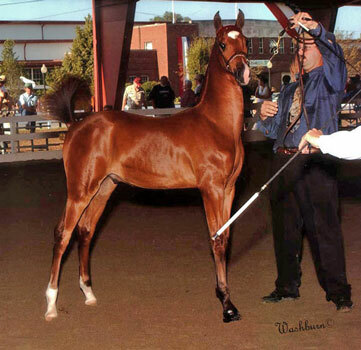 2004 Winsdown New Wave- (Chestnut Gelding by Winsdown Celebration) 2004 Colorado Futurity Weanling Colt Champion. 2005 Texas futurity Yealing Reserve Grand Champion and Champion Yearling Colt. 2006 Jingle Bell Fine Harness Reserve Grand Champion. 2007 Del Mar Charity Fair 3 Year Old Fine Harness Champion. 2007 Santa Barbara 3 Year Old Fine Harness Champion. 2007 California Futurity 3 Year Old Fine Harness Reserve Champion. 2008 UPHA Chapter One Park Pleasure Junior Grand Champion. 2008 SPotlight Open English Pleasure Reserve Grand Champion. 1993 Reedann's Raconteur (AKA Reedann's Cumulus)- (Bay Gelding by CH Caramac) 1997 Minnesota Futurity Horse Show 5-Gaited Junior/Novice Reserve Champion. 2002 Boone County Fair 5 Gaited Horsemanship Champion. 2002 Nebraska Charity 5 Gaited Horsemanship Champion. 2006 Boone County 5 Gaited Show Pleasure Reserve Grand Champion. Do Or Dice- (Bay Gelding by Harlem's Hot Dice) 2009 Summerfest Country Hunt and SB Classic Reserve Champion. Mid-Summerfest Country Hunt Grand Champion. 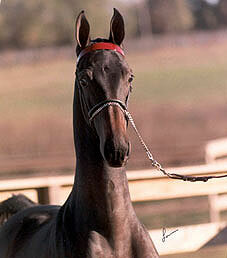 1997 Reedann's Sweet Cicely-(Bay Mare by Reedann's Top Gun) 2001 Des Moines Junior Fine Harness Champion. 2003 Mid-America Spring 3 Gaited Novice Rider Reserve Champion. 2007 Morehead Spring Park Champion. 2008 KASPHA State Championship Park Amateur Reserve Champion. 2010 IASHA Spring Warm Up SS Eq. 10 & Under Walk & Trot Reserve Grand Champion. 2010 Evansville SS Eq. 10 & Under Walk & Trot Champion. 2011 IASHA Spring Warm Up SS Eq. 10 & Under Walk & Trot Grand Champion. 2011 Evansville 3 Gaited Open Champion. 2012 Western KY Saddlebred Assn. 3 Gaited Show Pleasure Champion. 2012 Owensboro Park Pleasure Champion. 2012 Trigg Riding Club 3 Gaited Show Pleasure Champion. 2013 Evansville Charity 3 Gaited Show Pleasure Adult Champion. 2004 Winsdown Shadyside- (Bay Mare by Winsdown Hi Octane) 2004 Colorado LTD Grand Champion and Kansas Futurity Weanling Filly Champion. 2005 Kansas Futurity Yearling Filly Reserve Champion. 2005 Winsdown Bridgeworks- (Bay Colt by Winsdown Black Gold) 2005 Missouri Futurity Weanling Colt Reserve Champion. 2007 Del Mar Charity Fair 2 Year Old Fine Harness Champion. 2007 Santa Barbara 2 Year Old Fine Harness Champion. 2008 California Futurity 5 Gaited 3 Year Old Champion. 2008 Jingle Bell 5 Gaited 3 Year Old Reserve Champion. 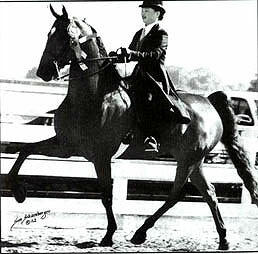 2009 Spotlight 5 Gaited Grand Champion. 2009 California Futurity 5 Gaited Junior/Novice Reserve Champion. 2010 Spotlight 5 Gaited Grand Champion. 2010 Del Mar Charity 5 Gaited Limit Champion. 2011 Seaside OPen Pleasure Driving Novice Champion. 2012 American Royale 5 Gaited MO/KAN Top Three. 2013 William Woods Winter Tournament 5 Gaited Reserve Champion. 2006 Winsdown New Thrill- (Bay Filly by Winsdown Celebration) 2006 TX LTD Stake Top 3. 2010 Winsdown Rainbow's End- 2010 Minnesota Futurity Amateur Weanling Grand Champion. 2010 Salina Charity KS Futurity Weanling Grand Champion. 2012 Denver Queen City CO Futurity 2 In Hand Champion. 2012 Winsdown Lady Mary- 2012 All American Horse Classic Open and Amateur Weanling Reserve Champion. 2012 NTASHA TX LTD Stake Reserve Champion and TX Futurity Weanling Filly Champion. Salina Charity KS and OK Futurity Weanling Grand Champion. 2013 Iowa Fall Classic- Yearling Reserve Champion. 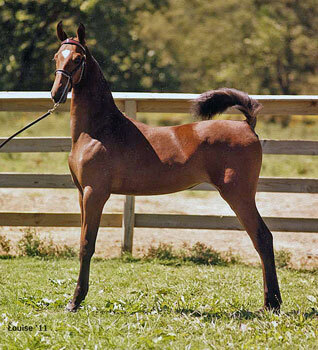 2013 NTASHA/UPHA- Yearling Filly Reserve Champion. 2013 Salina Charity KS Futurity Yearling Grand Champion and OK Futurity Grand Champion. 2014 Iowa Fall Classic Iowa Futurity 2 year Old In Hand Champion. 2014 NTASHA Fall Classic Amateur 2 Year Old In Hand. 2014 Salina Charity Kansas Futurity 2 year Old In Hand Champion, Oklahoma Futurity 2 Year Old In Hand Champion and Amateur 2 Year Old Champion. 2013 Winsdown DeMille- 2013 Iowa Fall Classic Iowa Futurity Weanling Reserve Grand Champion and Weanling Colt Champion. 2013 Salina Charity Kansas Futurity Amateur Weanling Reserve Champion. 2013 Salina Charity Oklahoma Amateur Weanling Reserve Champion. 2014 Salina Charity Kansas Futurity Yearling Grand Champion. 2014 Salina Chairty Oklahoma Futurity Yearling Grand Champion. 2014 Winsdown On Broadway- 2014 Iowa Fall Classic Iowa Ltd Stake Grand Champion (prize money $ 11,100.00) 2014 NTASHA Fall Classic Texas Ltd Stake Grand Champion and Amateur Weanling Champion. Salina Charity Kansas Futurity Amateur Weanling Champion and Oklahoma Futurity Amateur Weanling Champion. 2007 Winsdown Kathryn Hall- (Chestnut by Winsdown Westinghouse) 2007 Texas LTD Stake Grand Champion. 2008 Missouri Futurity Yearling Amateur Reserve Champion. 2012 WCC Vegas Moon- (Bay Mare by Northern Vegas) 2014 Kentucky State Fair WC 5 Gaited 2 Year Old. 2015 Lexington Jr. League UPHA 5 Gaited Classic Champion. 2015 Kentucky State Fair ASR National 3 Year Old Futurity WC 5 Gaited Division. 2016 Indianapolis Charity 5 Gaited Junior Champion. 2016 Lexington Jr. League 5 Gaited Junior Mare Champion. 2016 Kentucky State Fair 4 Year Old Sweepstakes World's Champion 5 Gaited Division and 5 Gaited Junior Horse World's Champion of Champions. 2000 Winsdown Three Rivers- (Brown Mare by Winsdown Black Gold) 2000 Texas Futurity Champion Weanling Filly, 2000 Oklahoma Futurity Weanling Grand Champion, Weanling Filly Champion, and Weanling Jackpot Champion, 2000 American Royal Missouri Breeders Challenge Grand Champion. 2001 Grand Champion Yearling Missouri and Oklahoma Futurities. 2002 Champion 2 Year Old Under Saddle and In Hand Oklahoma Futurity. 2003 Oklahoma Futurity Park Pleasure Champion and Park Pleasure Driving Champion. 2003 Tulsa Fall Charity Futurity 3 Year Old Park Pleasure Champion and 3 Year Old Park Pleasure Driving Champion. Winsdown New Twist- (Bay Filly by Winsdown Celebration) 2004 American Royal's Missouri Breeder's Challenge 3rd. 2007 Great River Benefit Open Fine Harness Reserve Champion. 2007 Mid-States Junior/Novice Fine Harness Reserve Champion. 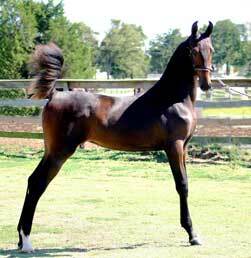 2001 Winsdown Falling Waters- (Bay Mare by Winsdown Black Gold) 2001 Texas Futurity Amateur Weanling Champion, Kansas Futurity Weanling Filly Champion and Oklahoma Futurity Weanling Grand Champion. 2003 Winsdown New District- (Bay Gelding by Winsdown Celebration) 2003 Texas Futurity Weanling Colt 3rd.